There’s absolutely loads of sightseeing to be done in Rome, but today we’re just going to be visiting the Circus Maximus… actually, there’s so much history in Rome that it’s nearly impossible to see just one thing. Just beside the Circus on Palatine hill you can see the arches of the Imperial Palace (here’s a photo for comparison), which the emperor Domitian connected to the circus so that he could get a better view. The most popular event at the Circus was chariot racing, where up to 12 would compete at a time. They raced the length of the track around a raised central divider known as the ‘spina’ (which is still visible in the image), upon which various statues of the gods were erected. Emporor Augustus also erected an Egyptian obelisk on the spina which, in the 16th Century, was moved to the Piazza del Popolo where it still stands today. 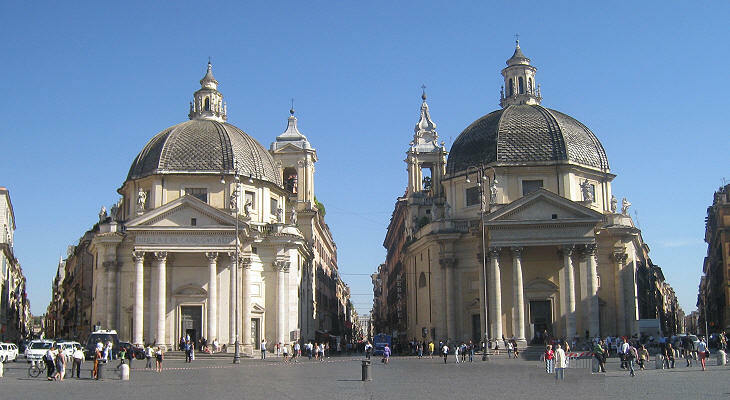 While we’re in the Piazza del Popolo it’s worth pointing out the spectacular twin churches of Santa Maria dei Miracoli andÂ Santa Maria in Montesanto (and there’s a good ground level shot here so you can see just how similar they are). Right, that’s your history lesson over for today (hopefully as concise as possible – history lessons always put me to sleep at school), but there’s an wealth of stuff I haven’t mentioned, so I’d recommend having a look at the Wikipedia pages on the Circus Maximus and Palatine hill. Thanks to Erin, Clint and Frank Castle for submitting the Circus Maximus and prompting me to investigate further. Roman chariot racing was recreated with great effect for the 1959 movie Ben Hur. The racing scene is one of the great moments in film, and is even more spectacular when you consider that it was done without modern special effects or computers. I believe that oblisk was given back to Egypt last year.